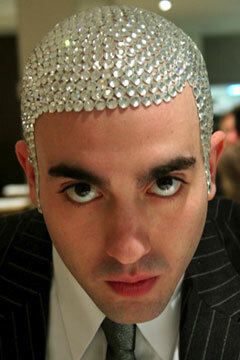 Phil Says Head Designs' Baldazzle, a painstaking glue job of about a million little crystals onto a bald dome. (A cap version is available so you're not glued to the barber's chair for a million and one years.) Admittedly, his site features much more innovative head art, so it isn't all cheese and gimmick. And then there's the Backtacular Gluteal Cleft Shield, whose name already suggests it expects to move into the Hall of Ridiculous Inventions. This would've been infinitely more marketable in 1999, when Mariah was teaching everyone to cut waistbands off jeans and expose their beautiful cracks, but is essentially a denim sticker to cover the offending plumber's crevice, and bling it up with some shiny rhinestones at the same time. It's all about class, baby.